Moulds are a type of fungi; a group of organisms that includes mushrooms and yeast. Mould spores are found everywhere. They are a common component of household dust. Mould spores grow more easily and can spread if they have excess moisture and a nutrient source. Examples of nutrient sources include wallpaper, ceiling tiles, carpet, insulation, drywall, wood, and other building materials. What are the health effects of inhaling mould spores? Moulds are generally harmless to most people. Allergic reactions such as chronic cough, watery eyes, and headaches can be experienced by those with sensitivities to mould. It can also cause negative health effects in those with underlying conditions such as asthma, COPD, or other conditions that weaken the immune system. Excess moisture is the root cause of all mould growth. How can mould be prevented from growing indoors? Eliminate the source of the excess moisture, and Repair all leaks and plumbing problems. Thoroughly clean and dry water damaged materials. Ensure your A/C is properly maintained. A properly functioning A/C reduces relative humidity inside the home. Keep relative humidity in your home between 30-50%. Change your air filters often—these trap spores. Properly ventilate your home. Turn on exhaust fans or open windows when cooking or bathing. Use a dehumidifier in places where excess humidity is an issue. Small areas of mould can be cleaned with household detergent and water. Bleach is not recommended. Large areas of mould should be cleaned by a professional. 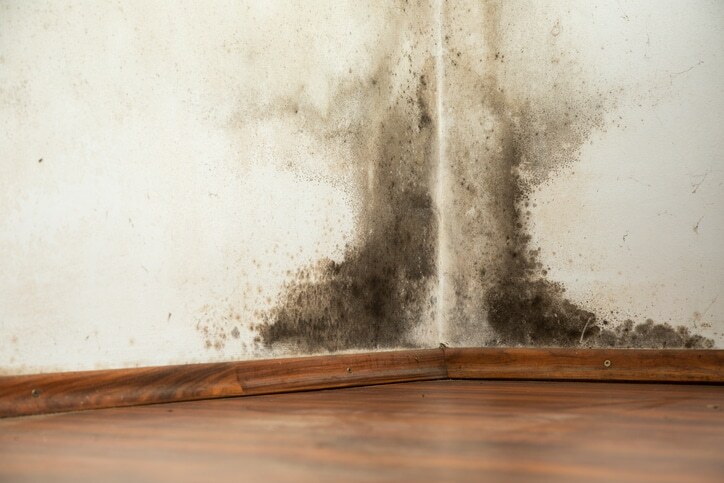 To prevent mould from coming back, it is essential to find the root cause of the excess moisture and take steps to either eliminate or reduce it.